Gypsy Scholar: A Turing-Tested Audience? Ava passes the test all too well. Caleb becomes infatuated with her and joins her plot to free herself from Nathan's control. It turns out that this very rebellion was anticipated by Nathan and is part of his secret plan. But Caleb anticipates Nathan's anticipation. 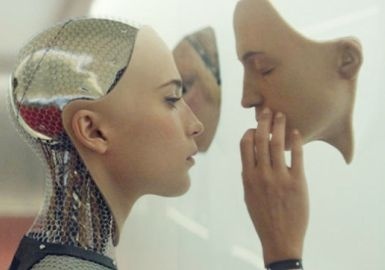 In Ex Machina one deception always operates within the framework of a larger deception. The final, all-encompassing trick is played on the audience's sympathies by writer-director Alex Garland. Right up to the conclusion, the fetching Ava seems to perform the role of maiden-in-distress, and Caleb, weedy nerd though he is, seems to be the knight who will rescue her from Nathan. But there's a catch. While Nathan may be an insensitive manipulator, he never lets go of one vital fact: Ava is a machine. By contrast, Caleb's gallantry blinds the audience to his monumental folly: he's become dazzled by sheer surface. So we are pulled up short in the final scenes by the recognition that we’ve been rooting for a self-deceiving fool. See? I told you that the movie is one big Turing test that most of us fail . . . Some might suggest the universe itself is one big Turing test that most (if not all) of us fail. Hence the need of intervention, or grace. Also of help sometimes is clumsiness. Hi Jeff, CPH here. Leigh, John and I went to see this actually, and I found it to be pretty interesting (I think they both liked it more than I did). I myself found "Her" to be far more engaging and at the end of the day, a truly superb sci-fi movie. These are sorts of techno-matters that will surely be in our future as a species assuming such progress continues; I guess just a matter of whether they're in our lifetimes, eh. "I'm not a robot"; more entertaining than usual here I suppose! I reckon you're right. I tell my students that they'll see this future . . . but I might not. A few months ago, scientists released a video introducing their robot dog, Spot. In the video, the handler kicked the robot dog to demonstrate how it can get back on its feet with ease. My first reaction upon seeing the robot tumble over and get back up was negative because my mind subconsciously processed the robot as an animal. I had to consciously remind myself it was a robot with no capacity to feel pain. If I am still alive when human-like robots become a reality, I'll handle that new world when it comes. Survival is not to the most intelligent or the strongest but the one who is most adaptable to change. I don't stop by your blog often these days due to job and personal demands, but I do think of your family from time to time and wish you all well. Thanks, Sonagi. I always appreciate your comments.